Tour Newark Homes on September 27! 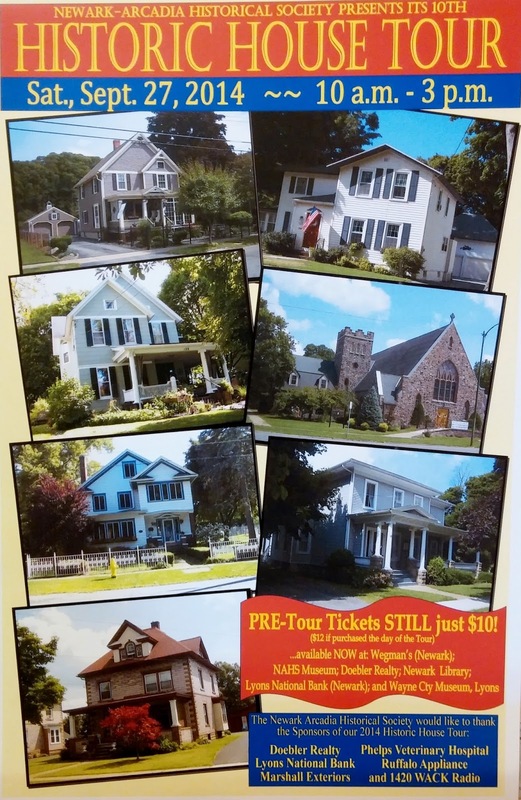 The 10th Newark-Arcadia Historical Society Tour of Homes will take place on Saturday, September 27th from 10 a.m. to 3 p.m. The event happens every other year and will include a snack stop at St. Mark's Church, and antique cars at selected homes. Reduced price $10.00 tickets are available now at Wegmans, the Newark-Arcadia Museum, Doebler Realty, Newark Library, Lyons National Bank, and the Wayne County Museum. Tickets prices will advance to $12.00 on the day of the tour. * The Addyman Home on Jefferson St., once occupied by Jean Henri Nicolas, rose expert for Newark's Jackson & Perkins Co.
* The Scalise home on West Miller St., a Sears Catalog home. * The Kent home on Grant St.
* St. Mark's Episcopal Church, Rectory and Memory Garden, corner South Main St. and Williams St.
* The Abeln home, Hoffman Street. * The Daughters of the American Revolution(DAR) Chapter house on High Street. Proud sponsors of the 2014 tour are Doebler Realty, Lyons National Bank, Marshall Exteriors, Phelps Veterinary Clinic, Ruffalo Appliance, and 1420 WACK Radio. 0 Comments to "Newark House Tour Set"